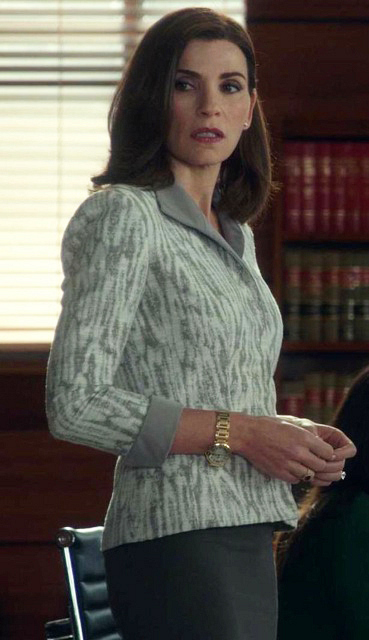 This Lafayette 148 tan and cream "marbled" textured suit had to help sell a plot point in the episode. Alicia inadvertently wears this suit to help in a soup kitchen. The press gets ahold of a photo of her and lauds her for being inappropriately dressed and calls her Marie Antoinette. I thought this suit was perfect for a few reasons: the very modern satin stand collar actually does put one in mind of an 18th century collar; the pattern is also reminiscent of a popular 18th century fabric pattern; the light colors made Alicia stand out in the soup kitchen; and finally, Julianna looks really great in the suit.